Happy New Year everyone! Today I have some big announcements and a challenge for you. If you want to make more music this year than you did last year, listen up. You need written deadlines and accountability. So do I. In fact I’m asking YOU to hold me accountable. Check out the video for details. Let’s do this! Awesome!!! Such a perfect kick off for the beginning of the year, looking forward to it! 2014 Will be a busy year for me too, but I think will set one deadline to get an EP’s worth of material recorded and mixed right along with you. Need to get a solid portfolio built up ASAP. Thanks for all you do Graham! Happy New Year! PS How do you like the Eris E8’s? Good eye 🙂 I’m liking them a lot. Might review them eventually. Still have some more testing to do on them. I keep an eye on them, I love Presonus products, they are awesome! I can’t wait to see the review on it, maybe they will be my next purchase. Brilliant as usual. You are the real deal. I’m up for the challenge…right along next to you. 3 songs written recorded mixed/mastered by end of march. Looking forward to hearing yours (don’t be late). Wishing you and yours a very happy healthy Light filled year. I know that deadlines make ALL the difference; I just need to be reminded of it! Many of us feel inspired and positive at the start of the year but without something to keep us focused we find ourselves fading as times passes (never using that gym membership!). Your three-month plan will hopefully keep us all on track. Thanks for all that you do, and a very Happy New Year to you, matey. Sweet! Let’s do this. You rock Graham. Just joined dueling mixes to start my year.And now I’m making my album dead line for Memorial weekend. Thanks for your knowledge. Graham !! You must be an angel from the 9th order of God. Not even a recording Seraphim would do what you do. on Jan 1st 2014 !! Awsome! Deadlines are the best tool! One of the first think I ask my clients when they send me a song where they wan me to play drums on if the have a deadline. It the don’t which they surprisingly often don’t have I like to set my own deadline when I want my parts to be done. Deadlines helps you to make decisions and move forward. If you have all the time in the world you can think about what your options are over and over again and you’ll probably start to second-guess yourself every time you try to make a decision. If you have a deadline you’ll look past the things that doesn’t matter and you’ll taken decisions that helps you to reach your goal. Because you don’t have time to second-guess yourself. Great idea, I was just giving me deadline to write my 2nd album to the end of December and I choked a little bit, I only told myself. Can’t wait the other videos and tips, I’m pretty sure they will rock! Happy new year to you and your family Graham! wow, i feel so motivated. I write a lot of music; but i release nothing, because my sound is bad. Has anyone got amy ideas that could help me get through this problem? Cause I am hopeless with midi drums! Maybe try getting your hands on an electronic kit? Roland makes some good ones… They’re compact, quiet, and can plug directly into your audio interface. These next three months are going to be epic! Yes sir, they will be epic. Sounds like a great help to all of us. I bought most of your vids last month ( New Years resolution to make my way through them ). I had already made a commitment to do an album this year. Have written 3 new songs this last month. The hole I see in your video series is the recording phase. I get really stumped on how to start the whole thing. If it’s just a matter of recording the guitar .. no problem, but putting down a drum track/sync track really throws me, since I’m not a drummer. Without that, later there’s almost no way to put in drums. Also, on the compression, I’m interested in using a compressor when recording, to get the highest gain and no clipping. Tips on avoiding clipping and increasing the gain would be helpful. Looking forward to using your tips to help me along this year. God bless. Thanks for picking up some training products. I know they’ll help a ton! Graham, I’m joining you in this challenge! I’ve got a head start though, as I’ve written most of the songs already! I’ve set a recording date of January 26. I’ll not only have these new videos to work with, but I’ll be using the jumpstart series i’ve purchased over the years! This is my first big personal project (5 song EP), so I’m very glad you are hear to help guide me! Graham, you’re such an inspiration bro! This is the first time I post a comment on your site but it is because I also want to commit to finishing a project I planned over 3 years ago. It has a lot to do with what you are saying, it will be e 5-chapter video lessons series about the stages of producing a song: composition, arranging and recording, mixing, mastering, and publishing. My song is ready, I bought all my necessary video equipment, and I have much of the content written in MS Word documents,… but it has been like that for quite some time with no other progress. I am ashamed of myself. Thanks for sharing your idea about public deadlines and accountability. God Bless and Happy new year!!! Happy New Year, and what an inspiring start you’re making. Perfect way to start off the new year – thanks for the continued inspiration. I’m halfway done with a 7 song EP myself, so April 1, 2014 is my personal deadline for completion. Good luck to you as well on your songs! My new EP coming March 31! I’m impressed I must say. The way you market and give back to all of us is very cool. Recording site. Tony was a great engineer and he liked my music ideas. He really believed in me and said I should write more and do an album some day. Some day never comes unless ,as you said you set some dead lines. Coming over from Cubase 4. I live in So Cal. Played bass in a Yes Tribute band. Happy New Year Graham and God Bless you bro. Happy New Year Graham, I am totally in. I will follow your blue print for getting the project done…with beautiful songs! Thank you. Great advice and exactly the info I needed. I produce as well and sometimes it’s easy to get carried a way with production and forget that I started all this as an artist. So thanks Graham I very much need and up for the challenge. I was thinking of writing and doing about 3 songs today and now I see your video. Great! Just what we all need to be held accountable! PS: does anyone know of a community like this in Spanish? Been looking forward to joining some and helping and learning as well in my native language. Happy New Year! I will try and write those songs. See what I can do. I think I will work on some now. That way it is good for prosperity that I started a few good ones on New Years Day!! Count me in! Gonna join you! Extended Play 02 songs each side. I just think they will have to be be all 04 on the same side, unfortunately… How I miss the seven-inch 45 rpm! Hey! Great video, as usual! I’m wondering if you can make a video on the paperwork necessary for running a recording studio business, if you haven’t made it already. I know, it sounds super-boring, but it seems to be a seriously important subject that is difficult to learn about on one’s own. On a separate note, I just finished your REthink Mixing course, and I am completely blown away at the OBVIOUS ways in which I have improved. 🙂 Even my wife notices, and that is saying something… 😛 Also, you should know that I am a Logic Pro X user, and there was not ONE thing in your course that I couldn’t use. Hey Graham! What a coincident! This year(2014) my church will be celebrating its’ 40th Anniversary and I planned to release an EP of 5-6 songs by August during the Anniversary service. Since last November I’ve started to challenge the worship leaders to write songs. We targeted to record all the demos by end of Jan. Arranging and orchestration to be ready by March. Recording will start in April to May, mixing and mastering around June. I target the EP to be ready with CD and Packaging by July. Our progress so far is 4 songs written(2 from me and 1 each from the other 2 worship leaders). We had formed a song writing team to help each other out. I recorded my first demo using just acoustics guitar with Alctron MC1400 large diaphragm condenser mic(ch. 1) and direct in(ch.2 )into Presonus AudioBox 22VSL. I used Studio One and all the stock plug-ins. I have a pair of Monkey Banana Turbo 5 speakers. Another thing is I will follow your advice in producing the entire EP just with the humble equipments/gears I have. (listed above), plus a Samson Graphite 49 Midi controller and my wife’s Ashton Rhythm UVX Electronic Drum. Finally of course a trustworthy SM57. I keep telling myself and our team that we may not have the most professional songs and EP, but this is the baby step we’re taking. We must start somewhere. Having a goal, vision and most importantly a clear deadline and make it public can help us take proper actions. It works! Thanks Graham for your timely videos. I look forward to your upcoming videos. This is great inspiration! Thanks for this challenge. I’ve been wanting to do my own music for TOO long. I’m in on this challenge! I’m in…. and thanks for all you do Graham. I’ve learned a bunch! Looking forward to april 2014! Create a thread in the Forum my friend! Hi Graham! Happy new year 🙂 🙂 Thanks for sharing this tip with us! A really motivating way to start things over! Woooo! I’m coming with ya Graham! Thanks,a lot, for every time you post something….I have learned so many with you….You are such a big light to me !!! keep up the good work. In the same line as Graham’s project, I am currently committed to write an album during the year. At my 50th birthday party in november I asked all my attending friends (most wanted to participate to a common gift) to consider theirs gifts as a private crowd-funding initiative that would force me to deliver a proper shrink-wrapped digipack album in the coming year. Instead of funding some fancy zero-g flight, the funds are going to be used for equipment (nothing extraordinary, I followed Grahams’s advice and bought a Behringer B1 + an Apogee Jam + a pair of second-hand studio Yamaha MSP5), but the funds will mainly be used for pro musicians, studio time, proper mastering and of course the physical CDs. PS: happy new year to every one. I suggest that we send our tracks we finished in April by following Graham to Graham and that he releases these on the website (if this is possible)? Challenge accepted! 4Chords Production will be releasing their first EP on March 31st! Will you be making a few videos or article on how to digitally release it on iTunes and what not? One aspect I’m really keen on getting ideas on is lyric writing. That always seems to be the phase that I procrastinate with because I find it a daunting task to write meaningful lyrics on a meaningful topic. Will you be discussing lyric writing, how to find a theme for your lyrics, etc? Would love some tips on that particularly. We’ll touch on it a bit. I am now going to lay out my schedule with deadlines for every song of the debut album i’m working on. For me deadlines never worked, but maybe because i never told others. Exciting. Hi Graham, is there’s a problem with my comment above (there’s a note saying “still awaiting moderation”). Please delete it if you feel so. Not sure why it got stuck. Just approved it manually! I’m having a go, and decided to make my deadlines quite public. Glad to be along for the ride. just watched the video. As usual, great motivational video there bro. good luck to everyone planning to start their EP. Just the motivation I need: It is so easy to get DISTRACTED by good things, so the BEST one doesn’t get done. I’ve had a kids’ album 90% mixed for about 2 years now, and March 31 sounds like a good date to set for the final product. Didn’t finish quite on time, but here’s my 4 song folk-rock EP! thanks a lot for the push, Graham! 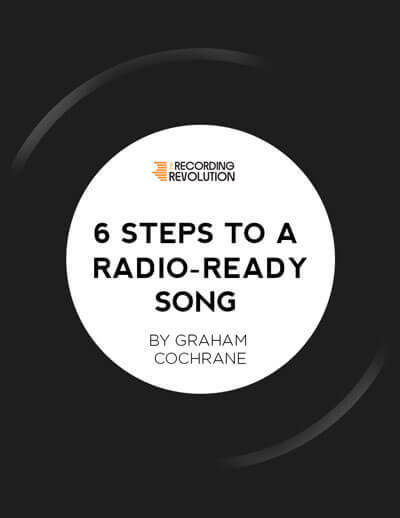 My name is Frank and I discovered Graham and the RecordingRevolution today (August 7, 2014). I read the eBook and watched countless youtube videos today that probably add up to 3+ hours. I love everything Graham is about and I would like to say that I feel and I am the same way. Learn your craft and “limit your options like your life depended on it.” Great insight! Recommended your site by friend yesterday, really inspired by your videos, love the idea of the creative switch and setting deadline for recording. got few songs Ive been sitting on for while which need finished, recorded and released so going to do so. aim for ep release by end of April 2015. would do sooner, but getting new daw(either cubase 7.5 or sonar x3 studio) and focusrite forte for christmas and want to get used to them. No skeptical or questioning comments? Smells funny. So you probably won’t publish this one either. Why on earth would anyone question or be sceptical about a video that is intended to motivate the viewer to be more successful in what they love doing? tiempo ando algo rayado con este tema e intento leer mucho sobre ello. igual modo poder desenvolver numerosas dudas que aún estimo. De todos modos, mil gracias por tu participación. Voy a estar atento a cercanas difusiones que ejerzas. criterio. He verificado que tienes más divulgaciones, propongo cogerme un ciclo para adivinarlas. Ten por innegable que acecharé todas tus divulgaciones. Te congratulo por tu espacio web. Un cálido saludo.